The pack is back! And I’m not talking about Green Bay, Bubba! 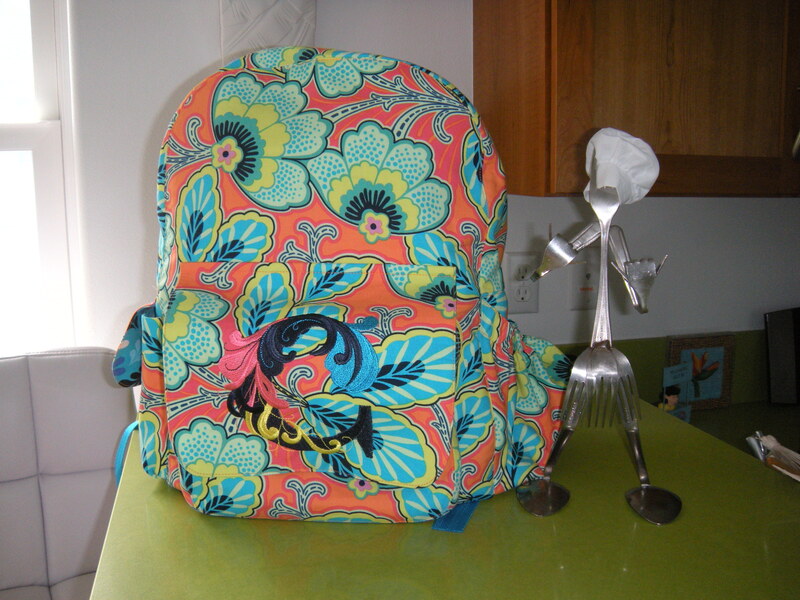 Backpack number two, travel bag number four. All in the New Year! The Shaka Hula Fork Chef wanted to get in on this one. Cheeky little guy. 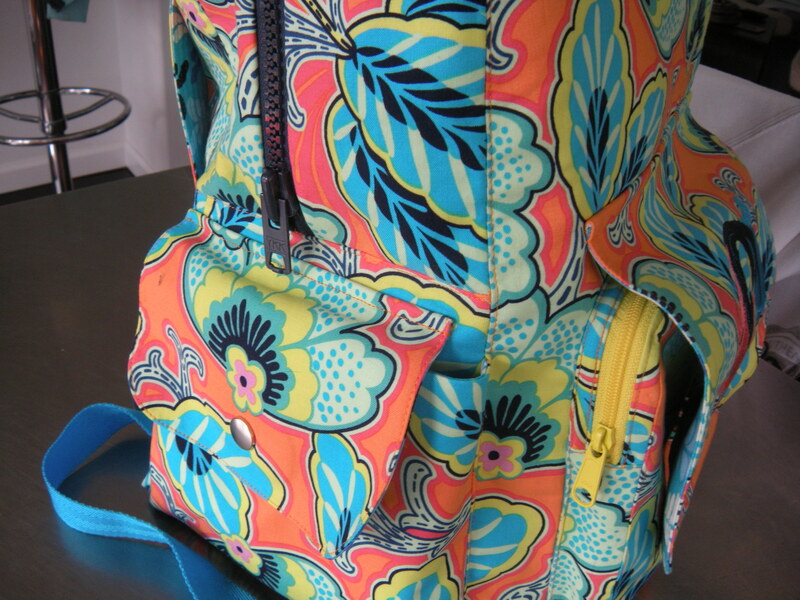 To recap my obsession…I am determined to make the perfect travel bag. One’s too small, one’s too heavy, one is ALMOST just right. I’m living Goldilocks and the Three Bears. Maybe this one will be Baby Bear. 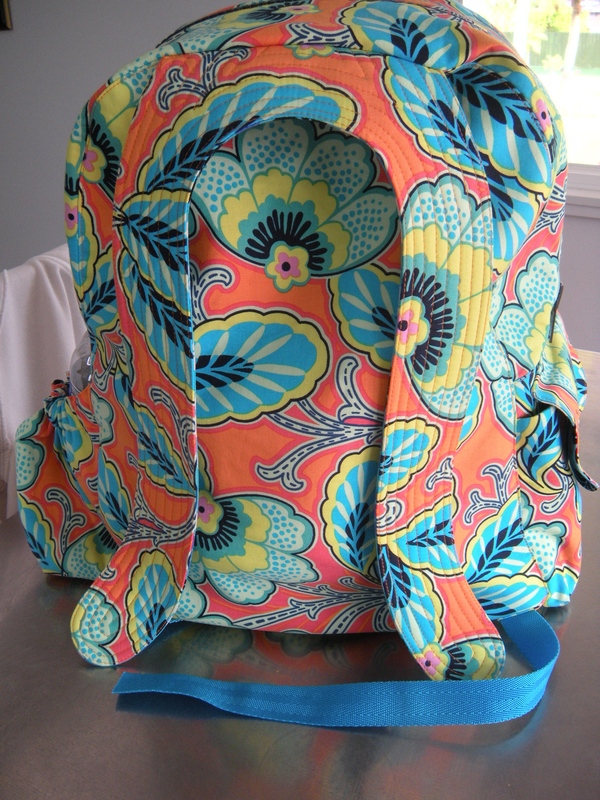 The pattern is the Dawn to Dusk backpack by Chris W. Designs. This fabric is from the Lark Collection by Amy Butler. I redrafted the pattern to add one inch to the width, two inches to the height, and two inches to the depth. And, by golly, my laptop will definitely fit into this one! 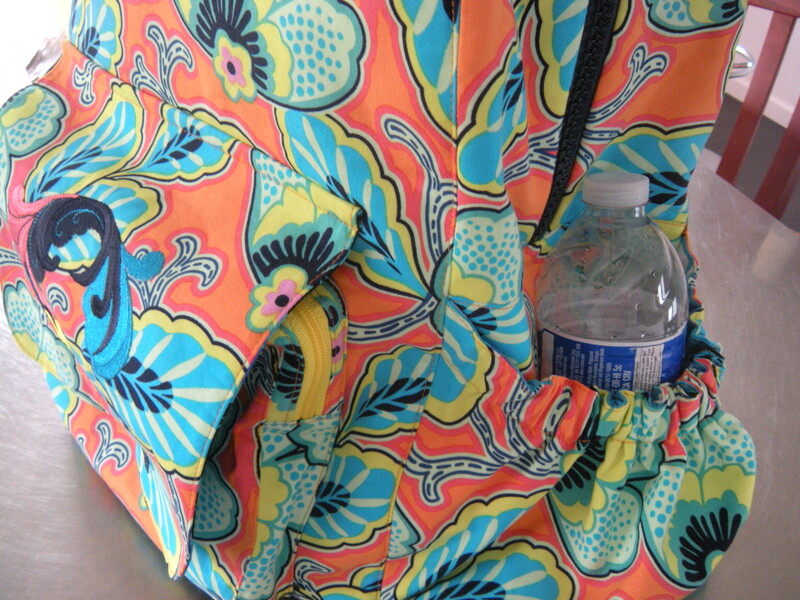 I had to redraft my redraft of the water bottle pocket to make it wider, and also added an inch in height. I put in a 2″ gusset at the bottom of this pocket, so the water bottle will sit nicely and not squirt itself out of the pocket. At this point, I’m pretty sure I could stash a liter bottle of vodka in this bad boy. Not that I’d want to do that, but I could. The snappy pocket on the other side also got a makeover. It’s 2″ taller and 2″ wider. I could actually put something useful in here. Like Junior Mints and a bottle of Ambien. Thankfully, I didn’t have to change the curvy strappy part. I still have to add on the buckles, then the outside will be done. Except for the fact that I forgot to put in the webbing at the top to make the hangy-uppy loop. Rip-a-dee-doo-dah. And I still have to make the lining. Wait ’til you see that! Bigger, better, faster, stronger. And monogrammed with a giant C.
When last we spoke, I was contemplating the shortcoming of my gorgeous Dawn to Dusk backpack. Just one shortcoming. It wasn’t big enough for my laptop. I spent the weekend drafting a larger version. Lots of pieces to this baby, and most of them needed to be resized. I added to all three dimensions; length, width, and height. One of the hardest things about making a new version is the fabric choice. I have to admit, I am in love with that Philip Jacobs Japanese Chrysanthemum fabric I used for the first one. 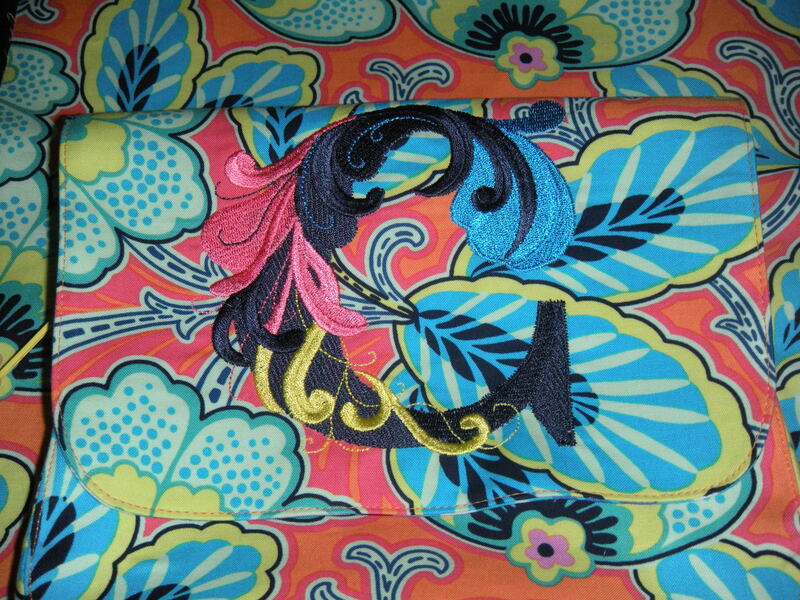 The good news is that I scored a gorgeous Amy Butler fabric at one of my local enablers. I seem to spend lots of my time lately disproving my own operational tactics. I really don’t like to make the same thing twice. But here I go again. I decided it needed something. Like a gigantic monogram. Lucky me, my first and last names start with the same letter. Then I went to the Urban Threads website. 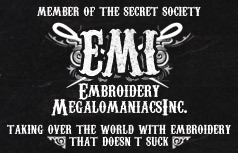 They have the coolest, most unusual embroidery designs I have found. And they are having a sale right now on alphabets! So I bought a massive letter. I did not want the monogram to be glaringly obvious, which is kinda counterintuitive when you are adding a humongous letter to your project. I picked brighter versions of the colors that are in the fabric, so that it could be seen but would not overwhelm the gorgeous textile. BTW, I also had to watch the Superbowl this weekend. Well, at least the ads and the halftime show. Katy Perry was awesome, especially riding in on the giant metal tiger. With guys in black bodysuits moving the legs. Of the tiger, not Katy Perry. And the little lost Budweiser dog…let’s just say, tears were shed. Now go make something pretty!